Our project is to design a hand powered tricycle for a toddler who has spina bifida which has caused limited mobility in her legs. 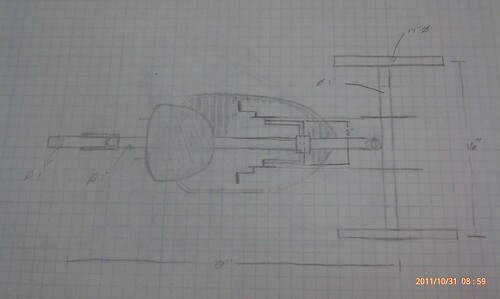 Friday September 9th our project group had a meeting with the parents of the child for whom we be designing the tricycle. The child is two and a half years old and is quite small for her age. We had the parents take some measurements so we could have some general idea of size when we began modeling. The child will need a seat with back support and a sturdy harness for safety reasons. We also discussed with the parents the position it would be most comfortable for the child to sit in along with the most comfortable position to support her legs. 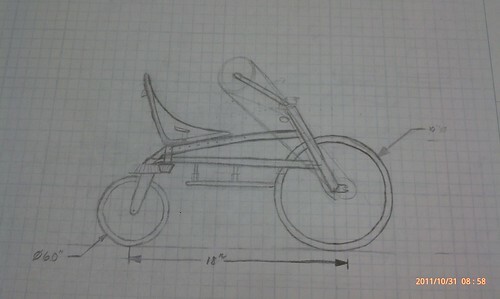 Our first design concept utilizes the standard chain mechanism used on a tricycle. 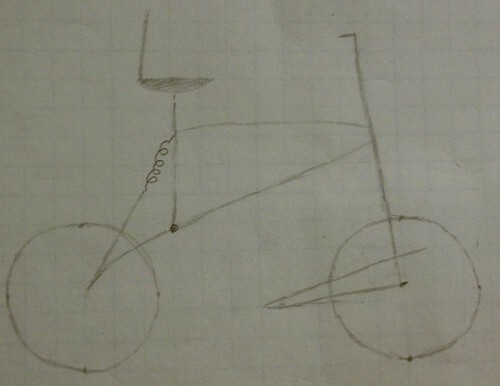 The chain, which will be covered by a casing, is connected to the front wheel and the hand pedals. This concept takes into account all of the design specifications. In particular, this design has a lot of support for the child and is adjustable so the child can use it for several years. 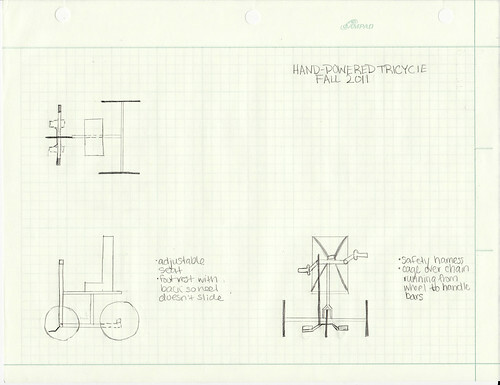 Our second design concept utilizes a shaft drive to connect the front wheel to the hand powered pedals. 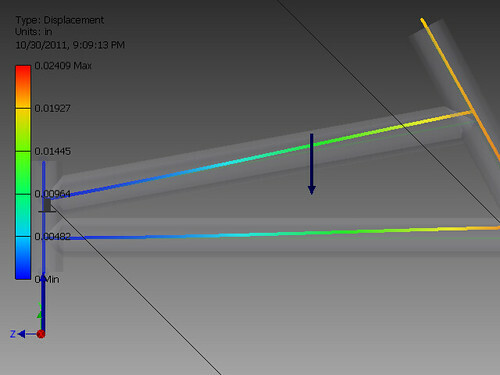 Our third design uses a system similar to the handle-levers on an elliptical machine which are then attached to the front wheel and use a system of linkages to translate the linear motion to rotational motion. The final design uses an unconventional steering method to accomodate for the hands being the sole driving force behind this mechanism. 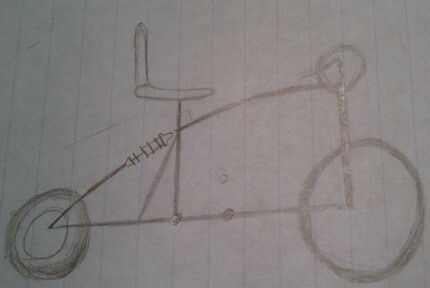 The seat is attached to a shaft and gear which is connected to the rear wheel and drives the tricycle. 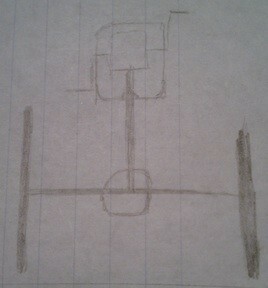 The pedals are connected by a chain to an axle between the front two wheels. 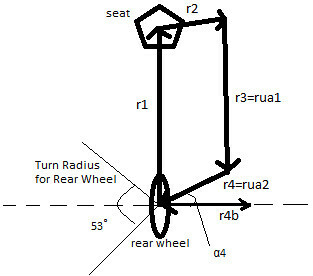 Using a desired turn radius of 3 ft and a calculated β2 of 26.5˚ (representing the angle that the wheel must turn to achieve a turn radius of 3 feet), we can then determine a linear relationship between the wheel angle (ϴ4) and the seat angle(ϴ2). 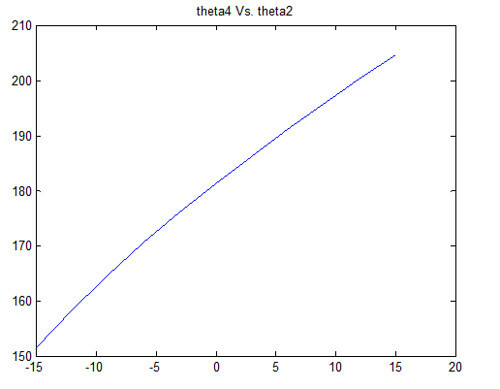 Using a maximum turn angle of -15˚ and 15˚ for the seat, the following linear relationship was derived: ϴ2*1.7667+180 = ϴ4 (where 1.7667 is the slope calculated as 26.5/15). 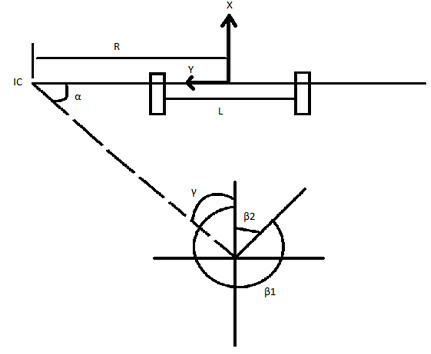 % over a defined input angle range. % r2 = 10; % angle of link 2 is my input, rotate fully. 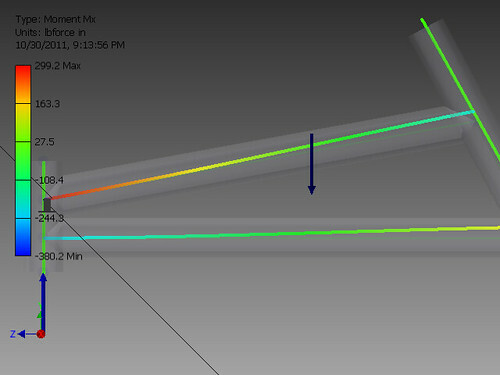 Frame deflection analysis performed using Inventor.